This is really a mapping of existing curriculum to badges with the addition of co-curricular activities. There is a lot of room for innovation here, in the end all badges are associated with traditional education and related activities. The traditional could also include badges within scouting organizations or other legacy based institutions that have been issuing merit badges for a period of time before digital and open badges. This is learning outside of the traditional curriculum. In particular, self-directed learners, autodidacts, heutagogues, and small groups engaged in informal learning. This is where people have the opportunity to develop their own badge systems. This is everything else where you would want to issue badges; participation in conferences, recognition for involvement with communities, accomplishments of merit, fun activities where tasks or activities have been achieved or participated in, this list could be anything that could be dreamed up where a badge could be issued. 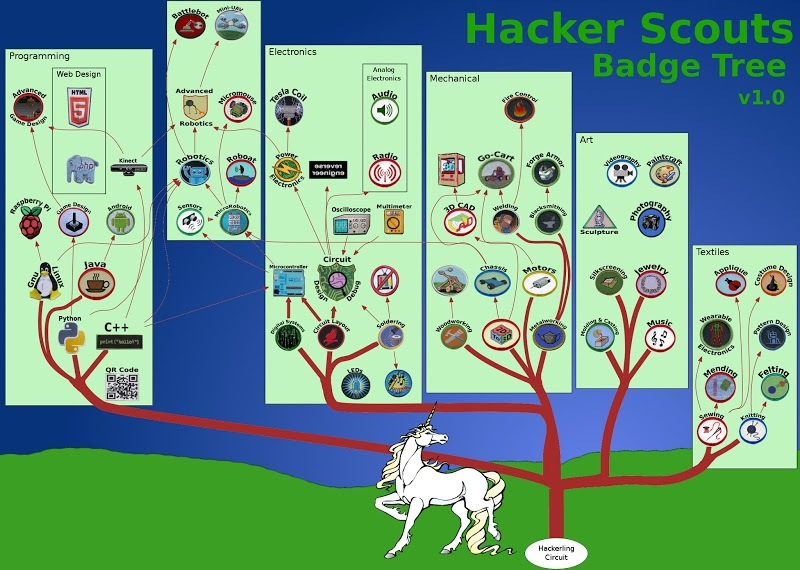 The hacker scouts have brought together the tradition of scouting, with the freedom of the hacker community, the resources of adafruit, the venue and innovation of the maker movement, with open badges. This image is the hacker scouts badge system design. Does a badge stand on it's own?